(English) PLAY Thomas Edison Visits Antigua. Edison was a dreamer, an inventor, a man who made things possible; some historians have claimed he invented the 20th century. 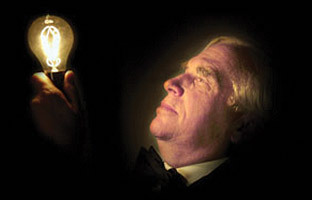 Hank Fincken portrays Thomas Edison in this one-man play. Fincken has performed as Johnny Appleseed, Thomas Edison, Christopher Columbus, Henry Ford, forty-niner J.G. Bruff, Francisco Pizarro, prosecuting attorney Richard Crowley and W.C. Fields in 20 U.S. states, Spain, Italy, Portugal, the Dominican Republic, Peru and Ecuador. Each script takes a minimum of two years to write and has been critiqued by scholars and theater professionals. His in-depth research as Edison assures historical accuracy, including crafted scripts, precise language, insights into both the past and the present. Because he incorporates the audience in every performance, each presentation molds itself to the unique interests of that particular group. Humor abounds. Each program is provocative, insightful, relevant, enlightening and entertaining. It’s art wearing a humanities tuxedo and a spinning bow tie. Contribution Q125 (includes one drink). Advance tickets at Revue (3a av. sur #4-B) and Kafka. Proceeds benefit Safe Passage/Camino Seguro. More about Hank Fincken at hankfincken.com.